Join the Perdue Crew - Get a Free Coupons, Offers and More! 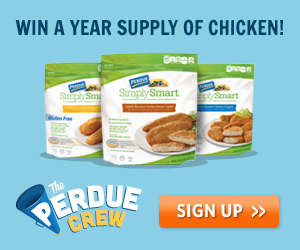 Join the Perdue Crew – Get a Free Coupons, Offers and More! You can sign up to join the Perdue Crew! This is a community of like minded individuals who love receiving and sharing recipes, cooking tips and deals. Community members will get the chance to participate in \monthly contests for the Perdue Crew members that allows the participants to earn prizes and special offers in addition to receiving interesting content and participating in fun campaigns. Head HERE or click the banner above to get signed up!! !